Where to even begin? Welcome, friends, to an article more fitting of our 'Random' tag than we could ever have imagined. 3625 Elm Ave in Baltimore US has appeared as an available listing on real estate brokerage site, Redfin. Normally, this wouldn't fall anywhere near our area of expertise, but the listing is so bizarre (and just about Nintendo related), that we simply couldn't ignore it. 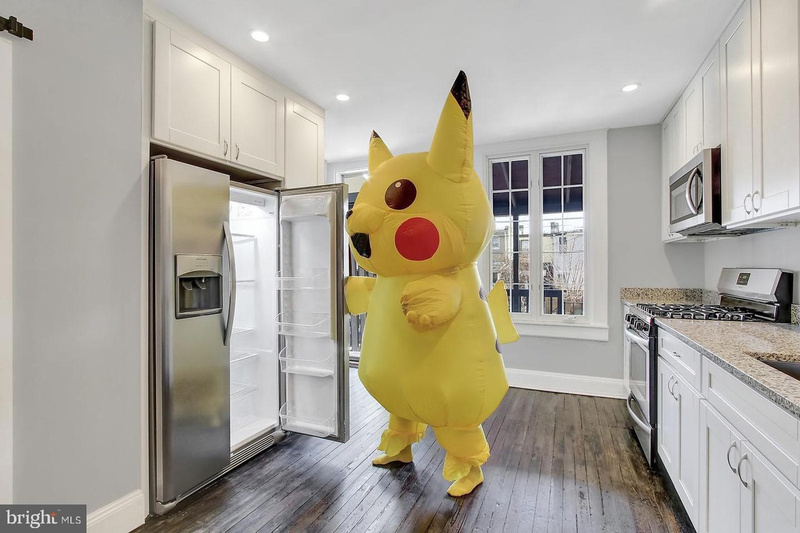 As well as standard photographs of the building, its rooms, and even local scenery, the property's photo album includes a whopping 21 images featuring the creepiest Pikachu we've ever seen, complete with human feet. 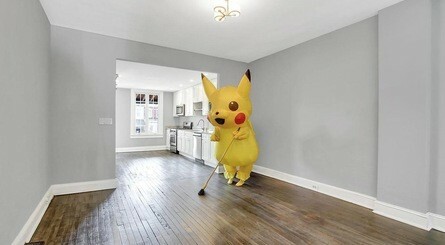 Why was this Pikachu employed to sell the house? What happened to the poor thing during its childhood? Will we ever get the image of the Pikachu in the shower out of our heads? We'll probably never know. You can check out the listing and all of its photos for yourself here if you like (until it gets taken down, of course). At the time of writing, viewings are available to be booked in, although we imagine that the Pikachu of Despair™ won't be there. Has this convinced you to buy the home? 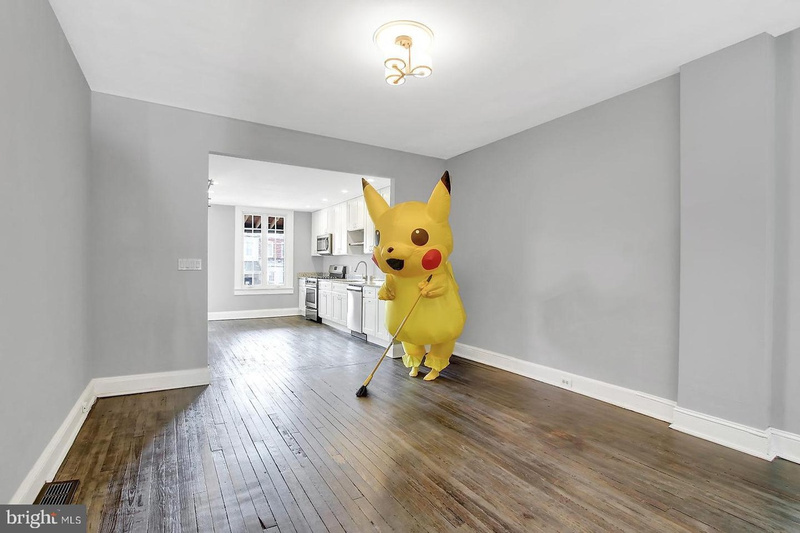 Would you like to be employed as a real estate Pikachu model? Let us know your thoughts on this important topic in the comments below. @Iacobus We live to serve. This is incredibly smart for viral marketing and I’m sure the home will sell quickly. Could Nintendo even stop this? Would they even bother? Seems harmless. 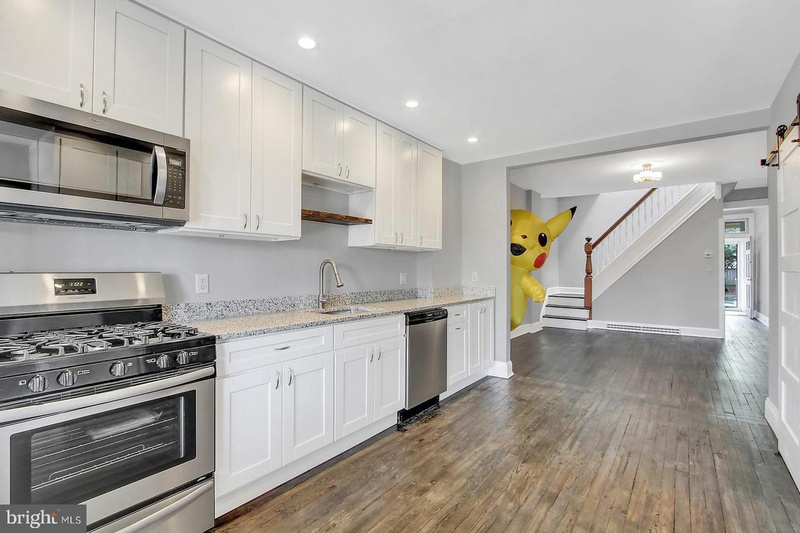 Is this being used to cheerily coverup a history of multiple homicides and suicides in the house, or are they saying “Pikachu” will live in your attic upon purchase of the home? Either way, it’s the beginning of a beautiful “direct to DVD” film. I actually wish all estate agents advertised houses like this. Oh, and that houses were cheaper. Reminds me of a few places I was looking through in Taiwan that decorated with Pikachus and Eevees in their photos. It's so creepy that their feet are protruding out of pikachu's....nah I'll have none of this. Ash Ketchum starts his career as a real estate agent. Be careful - it'll give you an awfully painful service charge. I must now purchase that house solely to exorcise that unholy demon from this world. @ryancraddock What? No sponsored link? The ONE time I was going to buy something from this site.. 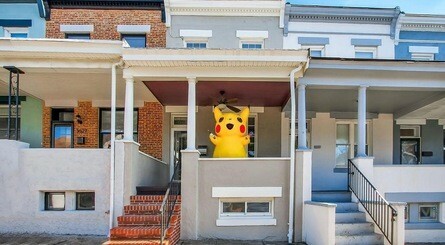 I would only live there if the Pikachu came with the place. Where's the guy with that dancing Pikachu avatar? He should be all over this lol. "Ash Ketchum starts his career as a real estate agent." I mean, what better mascot to explain inflating and deflating house prices? @HikaruKitsune Says the person with a furry profile pic. Why did they leave the human feet showing. Couldn't they just add some more fabric there? Naw. 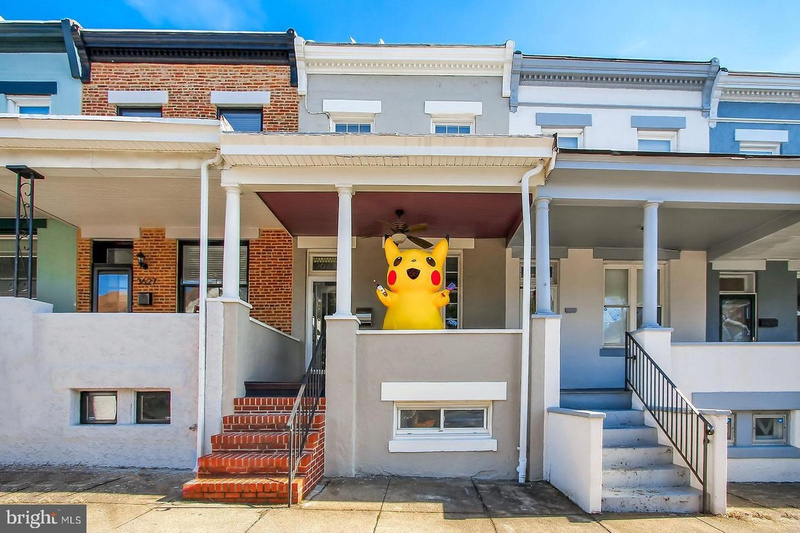 The homicides won't happen till after you move in, complete with a Pikachu clad murderer in your attic. That's the way it usually goes in the movies right? Careful, this unholy creature might be in rare possession of the taught move Illegal Taser. Dammit, that house is both nicer and way cheaper than my own house. Why the heck am I still living in the UK? Some photoshoots remind me of a Bendy and the Ink Machine moment, where he's stalking you... Creeper. In the middle of the night the first night, the new family has a child who hears pika from their closet. But no one is there. 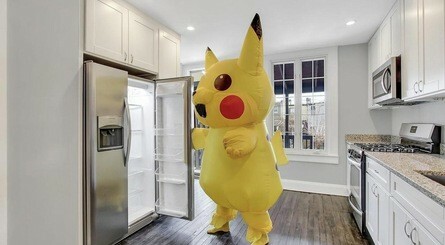 So on and so forth Pikachu never left the house! What the heck is an estate agent? The feet are just disappointing. The Pikachu itself is great. Is this even legal? Could we do this with, say Mickey Mouse? Or the Patriots? Or Iron Man? @KingBowser86: In that context, I think Kirby would be a better example. My wife pointed out that this Pikachu is there as a frame of reference. 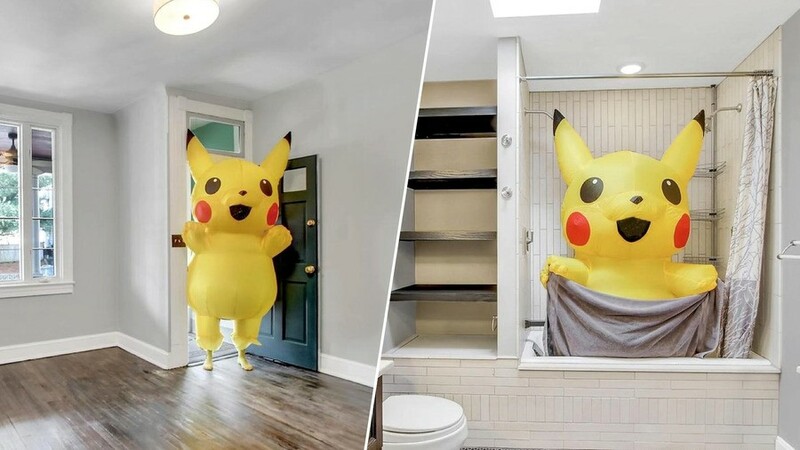 So, you can look at the photo and sat, "Oh, this shower is 2 1/2 Pikachus long," and now you know what size shower to expect. I don't find those images "creepy", I think they're hilarious. Will never understand why some people find certain things scary or creepy. This made my Friday evening. I'm just flipping through the pictures with the silliest smile on my face. 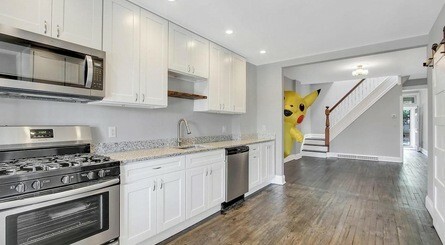 I lost it at the picture of Pikachu peeking around the corner, so hilarious. That's not Pikachu, it's Gigachu: the gigantic chu with chicken feet. That's a weird choice of blow-up doll. Everyone has their own kink. @Link-Hero : I wouldn't pikachoose it, but whatever floats one's boat, I guess. Kinda disappointed it wasn’t Elm St. So apparently this is becoming a new thing. 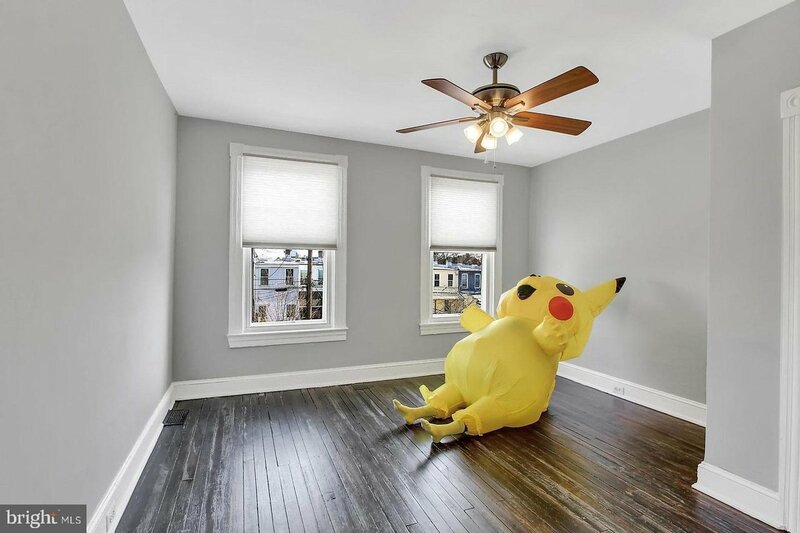 On that site there is even a listing of another home with a weird unicorn costume which looks even worse than the Pikachu one.